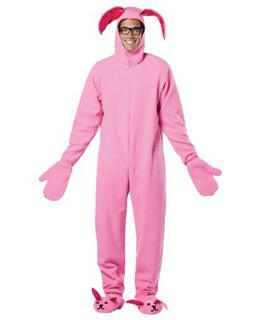 The A Christmas Story Bunny Suit is perfect for the nostalgic trick or treater. Inspired by Ralphie's bunny pajamas from A Christmas Story, this bunny suit is an adult-sized version of the classic footy pajamas. Check out all our A Christmas Story-inspired costumes for ideas on how to turn this great bunny suit into a group costume! One size fits most. Availability: The A Christmas Story Bunny Suit takes approximately 1 business day to leave the warehouse.